Indiana's new Religious Freedom Restoration Act law has created an incredible amount of controversy. Many, including quite a few business leaders, believe the law will allow discrimination based on sexual orientation or gender identity. For example, an owner of a ballroom might not rent the room out for a gay marriage celebration because she could claim doing so violated her religious convictions. The reaction has been swift and strong. Angie's list has put on hold expansion plans for its corporate headquarters, San Francisco and Seattle have banned city funded travel to the state and the NCAA is considering moving the final four out of the state. A similar law would have pretty much zero chance of passage in Minnesota. Minnesotans are way too progressive. Or maybe we just discriminate in different ways. Judges in Family Court can rule based on whatever they want. They can base their decisions on race, region, gender, sexual orientation, weight, or how well they like one of the lawyers. Or even how much one of the lawyers contributed to his campaign. They are even free to ignore criminal actions committed in their court. And unless they overtly state the reason they ruled the way they did was discriminatory, there is not even a basis for appeal. This is not a good system. To fix this we need better laws. Although divorce rates have held more or less steady for the last few years, the reason is because less people are getting married. 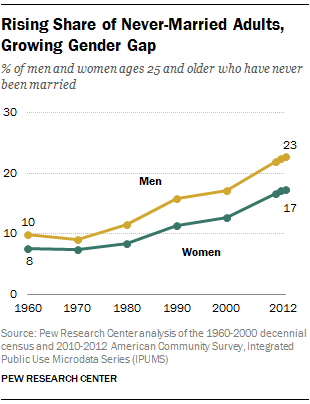 Pew Research Center reports that the number of both men and women who have never married is at record levels and growing. The reason isn't because people are becoming loners given that, "about 24% of never-married Americans ages 25 to 34 currently live with a partner." They are just choosing not to marry. I cannot find good data on why but a good bet would be that risk and cost of divorce is part of the reason. Marketplace Money had a story yesterday about Steve Stewart, a process server in New York who often serves divorce papers. Seeing the pain and cost that divorce incurs has caused him to not want to ever get married. One of the tragedies of the often unjust process of divorce is that many people conclude that marriage is not worth it. Despite having traditional family values, I could not in clear conscious advise my children to get married given the current legal environment. The risk is simply unacceptable. From 2012, a humorous article in the Sydney Morning Herald describes the plight of men who work in the Australian child care industry and more generally public attitudes toward men interacting with children in general. As I say the article is humorous but the points made are very serious. Johnson was delighted when the British Airways flight attendant announced he had to move away from the two restless, difficult children beside him. ''A man cannot sit with children,'' she declared. I mentioned Dr. Helen Smith's book Men on Strike a few posts ago. Dr. Smith also has blog hosted on PJ Media. PJ Media tends to lean conservative/libertarian but not exclusively. I don't know what Dr. Smith's politics are but her science seems pretty credible, even if some do not like the facts for political reasons. Which brings up a question I often wonder upon. What do you call people who believe in equal rights for all regardless of gender, race, national origin, or sexual preference - liberal or conservative? Is it conservative or liberal to believe all positions in the U.S. military should be open to women? Is it conservative or liberal to believe that policies stating that men in day care centers are not allowed to change diapers are discriminatory conservative or liberal? I have no idea but I believe that all discrimination based on gender is wrong. Back to Dr. Smith's blog. It is a great resource for information on the consequences, often devastating, that result from from discrimination based on gender. In her case, she focuses on the often overlooked reality of gender discrimination against men. Only focusing on gender discrimination against women addresses only half the problem. 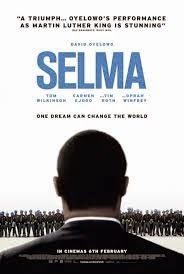 I recently saw the movie Selma which chronicles Martin Luther King's quest to prod Lyndon Johnson to propose and push for voter's rights legislation. The film was clearly made to be moving and it was. I can't even remember how many times it chocked me up. I highly recommend it. It is amazing how bad the situations was for blacks in 1965 in many areas. In Alabama there were counties with a majority black population but with no registered black voters because they were simply prevented from registering by the powers in local government. At the end of the Selma march, Martin Luther King's during his speech stated that for a white person, “no matter how bad off he was, at least he was a white man, better than the black man” This speaks to the real issue of racism, sexism, or any other for of discrimination. Power. Being able to feel that one is better than someone else is sadly quite alluring to people. Selma, Alabama in 1965 was controlled by a white (to be more precise, white, Protestant, heterosexual, male) group of people that were not about to give up their power and prestige for anyone. They didn't think they were evil, humans and a remarkable capacity for rationalization, and they couldn't imagine that anyone would ever allow blacks to have equal voting rights as whites. If you had told Jim Clark, the Sheriff of Dallas County which included Selma that we would one day have a black, or even worse in his mind, a mixed race President he would have told you that would be impossible. He could not conceive of such a world because it would mean the loss of the superiority his skin color gave him. 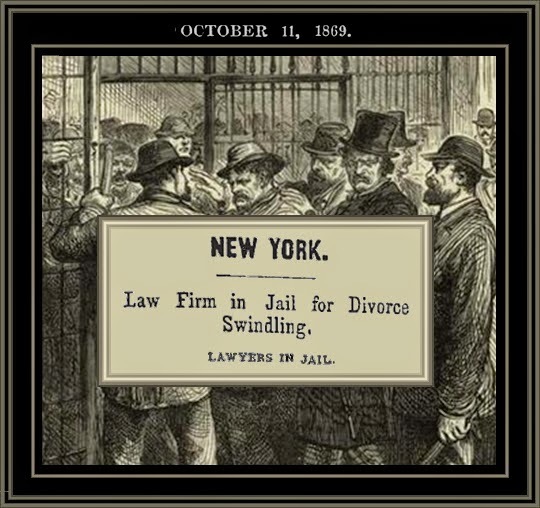 In my country divorce court is controlled by lawyers who cannot conceive they are doing anything wrong when they encourage clients to commit perjury or lie themselves under oath. Lawyers who will bleed clients dry in legal fees whether needed or not. 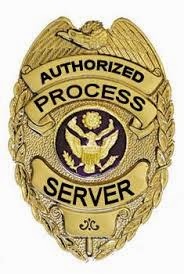 Judges who ignore the law and rule based on how well they like the lawyer, Ethical Boards that operate to protect lawyers from malfeasance rather than remove bad lawyers and law enforcement that ignores crimes committed by lawyers. Sound familiar? Men on Strike (Amazon link - the comments are a great read) is a book by Dr. Helen Smith released last year about men essentially withdrawing or going on strike when it comes to marriage and fatherhood. Why? Because of unfair laws and attitudes that hurt them. Dr. Smith's contention is that men are acting rationally in response. I have not read the book yet but will soon. Below is an interview with Dr. Smith. Lots of additional information can be found searching with Google. Janet Bloomfield lists 6 Things We Could Do Right Now To Make Men And Women More Equal. Often equality is used a term that really means just the opposite. As Bloomfield point out true feminists believe in true equality. Check out some of Bloomfield's other writings on sexism and other topics at thoughtcatalog.com. The site is practically a history book with an incredible amount of detail on individual and group malfeasance against men. Especially interesting is the long history of men's rights, which I had not realized. Because the site is so huge I suggest you start with the Greatest Hits page. I have updated the Reform and News Links section with a link to the site.